Yes, I want to promote GRN in my church! The resources below are designed to assist you to promote the mission of GRN, "telling the story of Jesus in every language", with your church or ministry group and amongst your friends and colleagues. Global Recordings Network (GRN) is a Christian missionary organisation which produces audio visual materials of Bible stories and Bible teaching for evangelism, church planting and discipleship. Our passion and focus is to produce gospel materials in audio visual format in every language and dialect in the world that needs them. We have now produced materials in over 6,000 languages and dialects. Our materials are available for free download from our website globalrecordings.net and through mobile applications at 5fish.mobi. We believe no tribe is too small, no language is too obscure and no village is too remote to hear the good news of Jesus in their heart language. 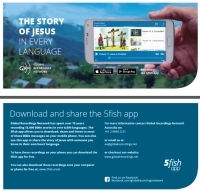 You too can use our materials to share the gospel on short term missions, in English learning classes or with a friend or neighbour in their heart language. Lulu comes from a small rural village in India with no Christians. They speak a small dialect, and don't yet have the Bible in their language. So how will Lulu find out about Jesus? Gary could be you or I. He's a Christian who wants to make a difference but isn't sure how. Then he finds out about Global Recordings Network. Compare the effectiveness of two Christians on short term mission. One with GRN's resources and one without. 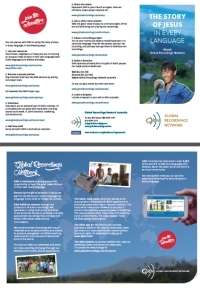 A brief summary of the vision and mission of Global Recordings Network. Telling stories is a powerful way to stir hearts and imaginations and to pass on key information from one generation to another. Uu comes from a small language group in Thailand and shares on how he worked with GRN to produce recordings of the Good News of Jesus in his language. 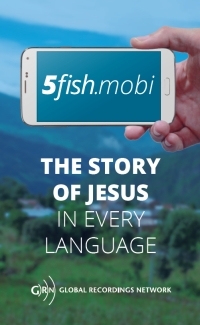 Share the Gospel in EVERY language with your mobile phone. 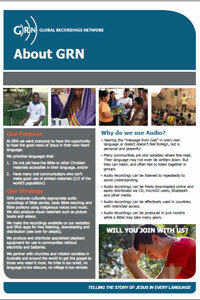 Learn about the vision and mission of GRN and how you can be involved. 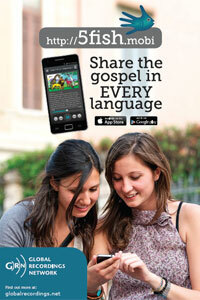 Promote the GRN 'Gospel in Every Language' app for mobile phones and devices. Promote the new GRN 'Gospel in Every Language' app for mobile phones and devices. Download and share GRN's 'Gospel in Every Language' app. DL size landscape double sided handout with information about GRN and the app. Layout is 3 to a page for bulk printing convenience. 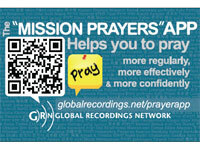 The new GRN Mission Prayers app helps people pray for GRN and other missions. 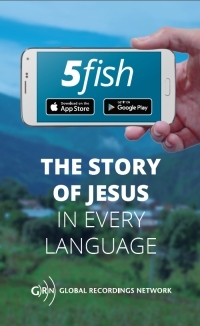 The GRN 'Gospel in Every Language' app (5fish) helps users download, listen to and share the story of Jesus in thousands of languages. 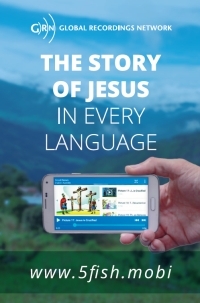 The GRN mobile website offers an alternative to the 'Gospel in Every Language' app and helps users download, listen to and share the story of Jesus in thousands of languages. 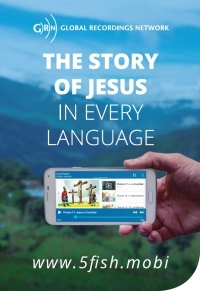 The GRN mobile website offers an alternative to the 'Gospel in Every Language' app and helps users download, listen to and share the story of Jesus in thousands of languages. This card shows a scene from a recording. Storytelling - Why does GRN use it? - Telling stories is a powerful way to stir hearts and imaginations and to pass on key information from one generation to another.